Transfer To Disneyland Hong Kong: Take the stress and uncertainty out of getting to Hong Kong Disneyland Theme Park by taking the easy way! 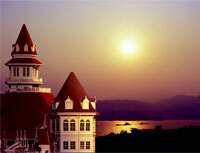 Enjoy round-trip transfers from your Hong Kong hotel in the comfort of a deluxe air-conditioned tourist motorcoach. This shared transfer service departs from your hotel every 30 minutes from 9:30am to 11:00am, and returns at 6:00pm or 30 minutes after the firework display. For every confirmed booking you will be required to print a voucher for presentation at the destination. You will receive a link to your voucher via email once your booking is confirmed.